Nothing says convenience quite like this trendy, 4 in 1 blanket! It is perfect for outdoor concerts, festivals and a wide variety of other events. 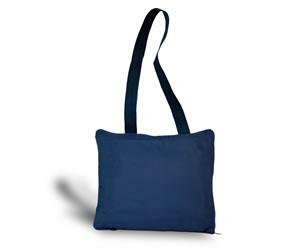 Use this item as a blanket, a seat cushion, a weather protector or even a stylish tote bag. One side is made of polar fleece while the other is polyester oxford. This item ships dimensional weight: 60 lbs. It measures 50" x 60". Give your clients a gift that are sure to appreciate and order this blanket now! Size: 50 " x 60 "
Ship Weight:35 lbs. / 24 pieces.